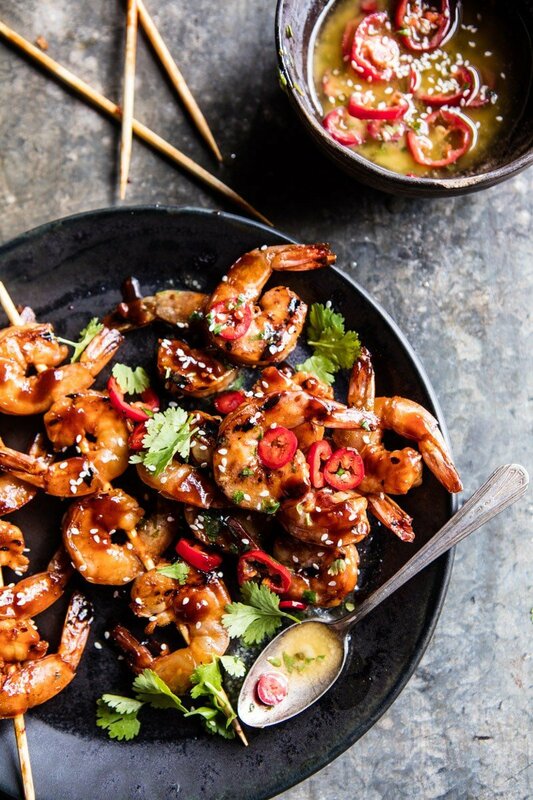 Korean shrimp on the grill for an easy Monday dinner! I don’t know about you guys, but I definitely have the grilling season bug. Like bring it on, I am so ready for it, excited for it, and I have some really fun recipes in store! 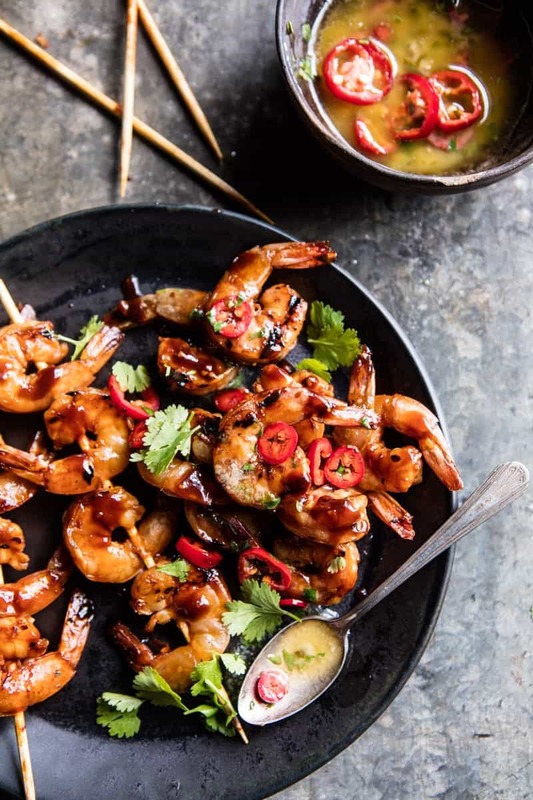 Today is all about this Korean style shrimp, but I have other fun recipes in the works for the upcoming Memorial Day…which is only two weeks from today! <–so crazy. Anyway, happy Monday guys! As I mentioned, I am in LA today and tomorrow, and headed home (finally) late Tuesday night. My family and I had such a great time in San Diego over the weekend. It was amazing to be with everyone…my entire family (including girlfriends…who are now a part of the family) + my cousins and my uncle…yes, all of us together in one place. Even my younger brother Red was in attendance and it was great to get to hang with that kid…even if it seemed like it was only for a split second. We spent Saturday pretty much soaking up the sunshine. Even though the temp was a brisk sixty-two degrees it was still plenty warm in the sun. Unfortunately for me, even though I re-applied sunscreen multiple times, my legs currently look like a very red lobster. For real, I swear my skin sees the sun and no matter what I just burn. It’s horrible and I promise I had so much sunscreen on the whole time. Ugh. Aside from my lobster legs I loved every minute of the sun, like every minute. Sunshine is my absolute favorite thing ever. We spent Saturday night celebrating my cousins graduation, and then for Mother’s Day we gave mom some fun gifts, had breakfast and explored San Diego a bit. Perfect weekend filled with literally all my favorite people. And today it’s back to work, but I’m pretty excited for everything I have in store! YAY. OK, but let’s talk shrimp! I’ve been loving shrimp lately. It’s quick cooking, delish, and seems like it’s a hit with everyone who tries it. 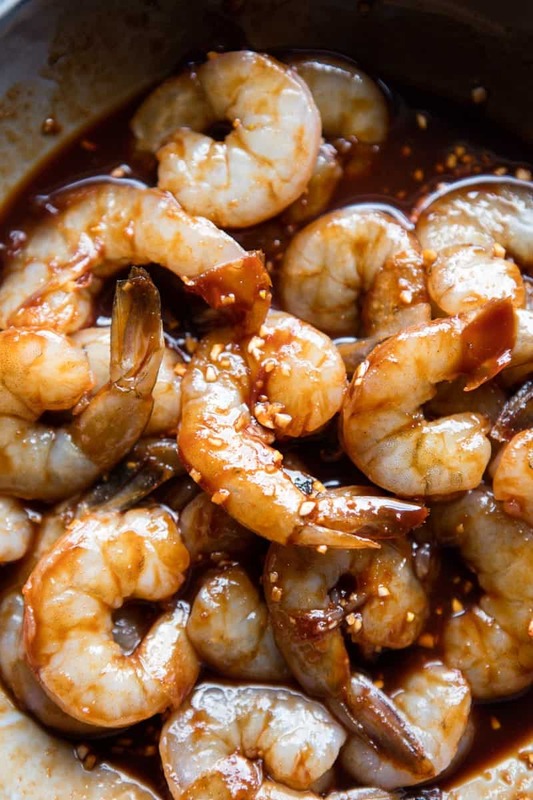 As I mentioned, I’m really in the BBQ kind of mood these days, so I decided to take my favorite homemade Korean BBQ style sauce and toss it with some shrimp. Why I did not think of this sooner is beyond me, but the combo of sweet and spicy Korean sauce on shrimp is pure perfection. 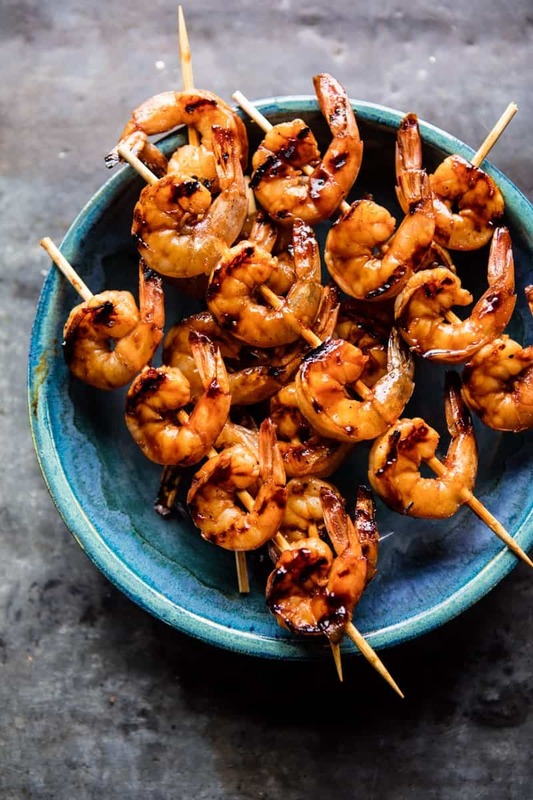 Think Korean BBQ, but on shrimp, with a little citrus honey butter added in too…because I feel like you can’t do a grilled shrimp without a little buttery sauce, you know? I served the shrimp over a bed of rice with a side of grilled veggies. So good, and great for a super fast Monday dinner, which I’m feeling like we could all use today! The key to this recipe is the Korean BBQ sauce. I know I’ve talked about this so much before, but if you guys are not familiar with gochujang then I highly recommend you give some a try. I like to buy the Mother In Laws brand from Whole Food, which has ingredients that I approve off. 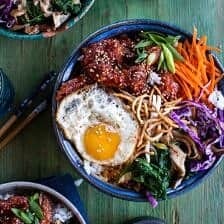 Gochujang is my favorite non-traditional ingredient! Aside from that odd-ball ingredient, this recipe is easy, peasy. A must make for any busy night when you want a good, quick dinner. And you guys…the citrus honey butter? It’s definitely not needed, BUT it adds a really nice finishing touch and makes the shrimp feel extra special…meaning it’s actually kind of a must. <–do it. PS. totally trying to get my brother to run to Whole Foods today and gather up these ingredients so we can make shrimp for dinner. Kind of in need of a good home cooked meal! 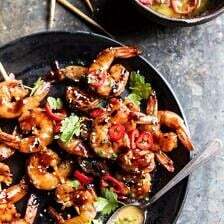 This grilled shrimp is full of Korean flavors. Quick to make! 1. In a large ziplock bag, combine the soy sauce, honey, garlic, gochujang, sesame oil, and lemon juice. Add the shrimp, seal the bag and toss to coat. If desired, you can marinate the shrimp for up to 24 hours, but it's not imperative. 2. To make the citrus butter. In a small sauce pan, combine the butter, orange juice, and lemon juice and cook over medium heat until the sauce is melted and smooth. Remove from the heat and stir in the cilantro and chiles. 3. Preheat an outdoor grill or grill pan to high. 4. Thread the 4-5 shrimp on skewers and grill each skewer for 2 minutes per side or until the shrimp is cooked through. 5. Arrange the skewers on a platter or plate and serve drizzled with the citrus butter and top with sesame seeds and cilantro. Enjoy! Monday dinner never looked so good. Bring on that Korean BBQ Shrimp. Hi Tieghan, I love your photography, I’m just wondering, what camera do you use, it takes brilliant photos. Love everything that you make. It is genius. I hope you love this Rachel! Thank you!! Omg! I love Korean food so this looks perfect for me. Korean food is always soo flavorful. 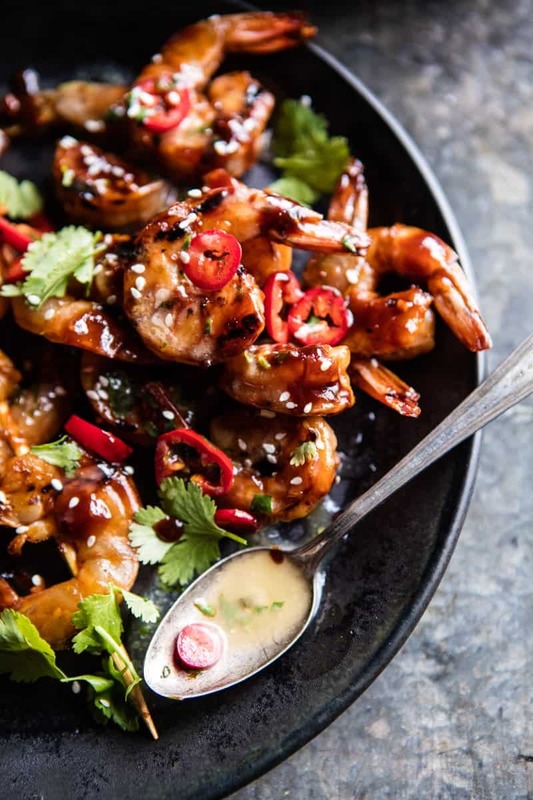 And I can just imagine how delicious this shrimp with be especially with honey garlic. Cannot wait to try this! Perfect! I hope you love this Andrea, thanks! 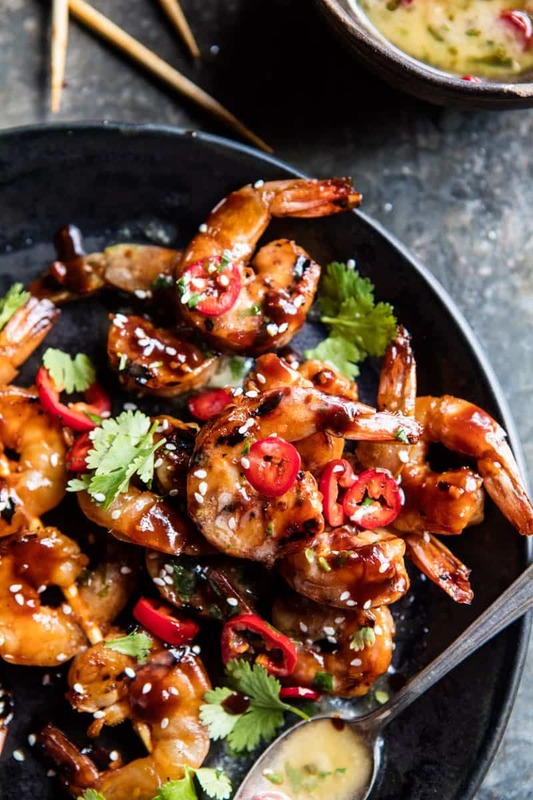 Ooooh this sounds really good, I do love grilled shrimp! I hope you love this grilled shrimp haha! Thank you Ruth! Tieghan, you have the art of making food looks amazingly good and pretty delicious. Love this dish! Thank you so much Carlos! Whole Foods has the best ‘non traditional products’. Loving grilling season too! I’m obsessed actually! They do have some awesome stuff! I hope you love this dish Lindsay! Thanks! This shrimp looks amazing!! And the ingredients for the citrus butter sound amazing! Great recipe for summer barbecues!! Yes perfect for summer! Thanks Deborah! kbbq is my faveeee. this sounds tasty with the citrus butter, and with a side of rice i’d be set! Haha YES! I hope you love this Heather! Thank you!! Ooooo those citrus butter ingredients look amazing! Might make this for my next BBQ! Perfect! I hope you love this Amanda! Thank you! I am so glad it went great for you Brooke! Thank you! These shrimp look so good, what a perfect Monday night dinner! I made this last night and everyone loved it. Not spicy, though, may add some cayenne next time. We have extra citrus butter, will use for corn on the cob tonight. Thank you! The spice should be delish with cayenne! Thanks so much for trying it Lori! This looks so delicious. 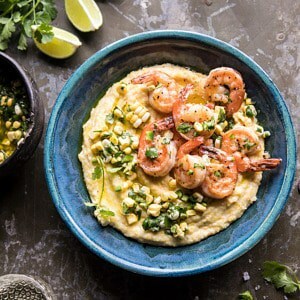 I’m totally into grilling at the moment and I love shrimp so this recipe is perfect! I’m going to make it tonight. Ah yay, I hope you loved them Winnie, thank you! I totally agree! I will have to try it!! Thanks! Hi Tieghan. This was great and I didn’t even do the citrus butter. 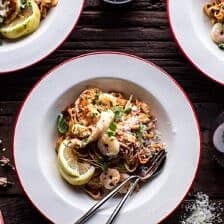 Do you have a list somewhere of your all-time favorite recipes? There are so many great ones here and I’m curious as to what your top 10 or 20 are. Thank you! Give me all of the Korean BBQ shrimp!! Definitely need to whip this up this weekend! I hope you love it! Thank you! I really, really enjoy your blog & can’t wait for your book. I have been making and we have been enjoying many of your recipes. Your photography is beautiful and enticing, of course, but more important, the directions are clear and simple to follow. 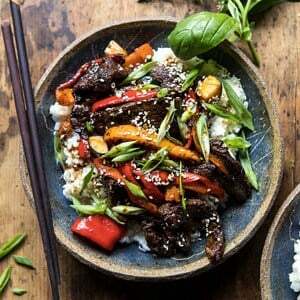 I am going to try this recipe next week, after I get up the gochujang . In addition to rice, what vegetables do you reccomend grilling to accompany this dish? Would you also skewer them and marinade in the sauce? So i’d grill up zucchini, bell pepper, and maybe some corn, but any veggie you love will be great! You could skewer them, but I’d just toss them with olive oil, salt, and pepper. Hope that helps and let me know if you have any other questions. Hope you love this recipe! Fantastic recipe!! I only made ten shrimp per person and I wish I would have made many more. The citrus butter was also a hit. I didn’t have Fresno chilis so I put some Siracha in and it worked great. That BBQ sauce recipe is gonna be used again later this week on some chicken I have. I think this sauce would be good on everything. I am so glad you and your guests enjoyed this mark! Thank you!